Ancient Tree White Moonlight Buds is a rare and highly distinctive tea specialty from Yunnan, China. It is the pure buds, handpicked during March and April from ancient Yunnan tea trees and processed according to a secret method passed on from one generation to another in the producer’s family since hundreds of years. Regarding taste, White Moonlight Buds Tea combines the elegance of a White Silver Needle tea with the rich and depth of teas yielded from ancient wild tea trees. For more information and illustrations, please refer to the detailed product description below. Ancient Tree White Moonlight Buds is a rare and highly distinctive tea specialty from Yunnan, China. 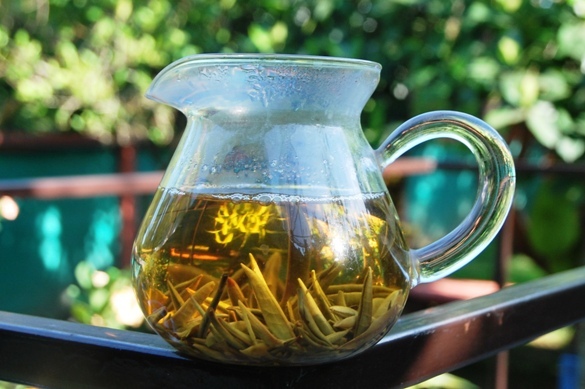 While there are many attempts today to copy white tea (Bai Mu Dan/White Peony or Baihao Yinzhen/White Silver Needle), originally yielded from the Da Bai tea variety in the Chinese province of Fujian (Fuding and Zhenghe), in other tea cultivation regions and from other cultivars, White Moonlight Tea is a genuine Yunnan tea tradition as ancient as the tea trees it is made from. 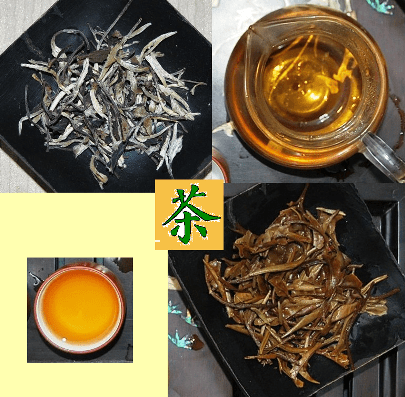 It is made available in two versions, one of which is White Moonlight Tea with a 1:1 ratio of buds and adjacent tea leaves, and the other one is the pure White Moonlight Buds. Tea Master Zhang Tian’s family from Jingu in Yunnan has been growing and processing Moonlight White Tea and White Moonlight Buds for countless generations. Their property is home to a population of “wild” (actually: semi-wild, as they are of wild origin, but are cultivated today) tea trees, the oldest of which is about 800 years old. 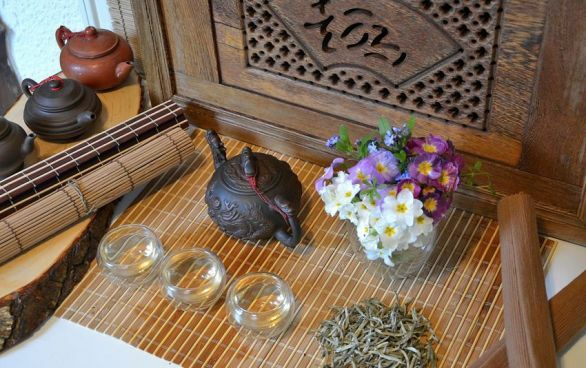 While keeping the exact details of the method a secret from the outside world, the skill required for the delicate handpicking and processing of Moonlight White Tea has been developed and passed on from one generation to another for hundreds of years in the Zhang family. White Moonlight Buds tea has its name from its unique shape and color. One the one side, it refers to the distinct crescent shape of the white Moonlight tea bud, making it look like a crescent moon, while a second aspect is the characteristic color pattern of the White Moonlight tea leaves, which are white on the top side and black on their back, just like the moon, whose one side is lit by the sun, while the other one is dark. White Moonlight Buds tea is picked in very limited quantities during March and April each year, when the first buds and tender tea leaves are emerging from the ancient tea trees. The processing, involving a delicate air-drying process, is tightly bound to the spring season, too, as only the climate conditions are proper for the withering and curing of Ancient Moonlight Tea. The cool spring weather and the resulting slow growth of the tea leaves coin the flavor and aroma of White Moonlight Tea through a particularly high concentration of active substances. 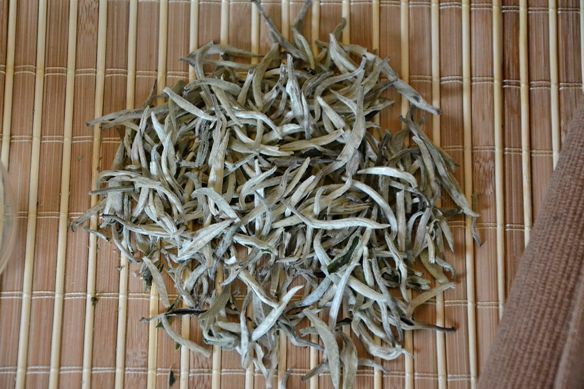 The silky, smooth, fuzzy, silvery white buds please with a taste that combines the elegance and gentleness of white silver needles with a richness and depth that are unprecedented in the white tea category. It is especially its broad and complex nutty flavors that distinct White Moonlight Buds from Fuding Silver Needles, tastewise. To this adds the characteristic “Qi” of the wild born, ancient tea trees, generally producing a clearer felt, more intense, but nevertheless pleasant and balanced effect on the human body. White tea, being high in amino acids and polyphenols, is widely considered as having strong antioxidant features and cooling effects on the human body and blood, being beneficial to eyesight, strengthen the immune system and raise energy levels, along with concentration-improving and mood-enhancing properties. Preparation: Pour 200-250ml of 80°C – 90°C hot water (let cool for a short period after boiling) over 4-5g of White Moonlight Buds. Infused for up to 3 minutes for full taste, White Moonlight buds will produce 3 – 4 delicious steeps. As other white teas, White Moonlight Buds are particularly well suitable for delicious and refreshing cold infusions and/or ice tea. With this tea, I have the chance to drink a fabulous white tea. He tasted the fresh almond, The both sweet and fruity. Very soft in the mouth. It leaves a refreshing impression. Wonderful. Bright, almost colorless brew. Aromatic tall white florals – osmanthus, spring honey, almond milk. Milky texture, smooth & fresh nuts. Pure lingering persistence, very clean impressions of sweetness. Wow!